Product Details-Composition-Ketochonazol IP - 1.0 % w/w Chlorhexidine Gluconate Soluttion IP Equivalent to Chlorhexidine Gluconate - 2.1 % w/w. Features - Store in a cool dark place.Do not allow ingestion.In case of ingestion contact veterinarian immediately. Use- Suitable for management of skin problems such as bacterial or fungal dermatitis in cats and dogs.Suitable- Dogs and Cats of any age. Quantity - 200ml. 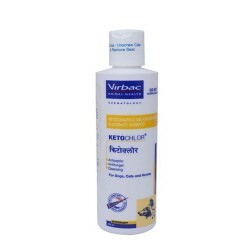 Product Information -If you have a pooch or a cat who has sensitive skin or skin prone to dryness-rashes,Virbac Ketochlor Shampoo is ideal for bathing them. The gentle healing shampoo is ideal for management of skin infections that may be bacterial or fungal in nature. 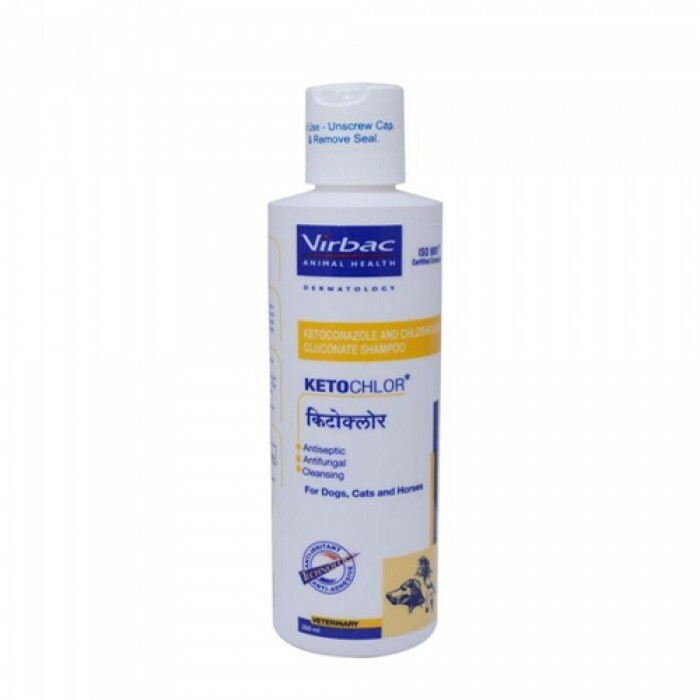 Indication - For Management of problems related with bacterial and fungal dermatitis in dogs and cats. Direction of Use-Wet the hair coat with warm water and apply a sufficient amount of shampoo to create a rich lather. Massage shampoo into wet hair coat, lather freely. Allow to remain on hair for 5-10 minutes then rinse thoroughly with clean water. Rinse and repeat may be used regularly or as directed by veterinarian. Composition Store in a cool dark place.Do not allow ingestion.In case of ingestion contact veterinarian immediately.